Solitude is practically guaranteed at Big Bend National Park, as are dark nights bursting with desert-kissed stars. On the northern edge of the arid Chihuahuan Desert in southwest Texas, the Chisos Mountains of Big Bend provide a diverse oasis in a land of tremendous contrasts. Up on 7,825-foot Emory Peak, mountain lions stalk javelina through aspen and Douglas fir, while below cacti dominate the undulating desert terrain that seems to sprawl to the edge of the earth. Why Visit Big Bend National Park? There are few places in the U.S. like Big Bend—rich with history, offering solitude in a landscape that can, at times, resemble the moon. As an added bonus, being so close to the Mexican border provides the chance to learn about America’s neighbors to the south. So whether you’re a hiker, cyclist, kayaker or simply want to get away from it all, Big Bend has something for everyone. With more than 800,000 acres to explore, Big Bend National Park is larger than Yosemite or Great Smoky Mountains, but sees a fraction of the visitors of those big-name parks. 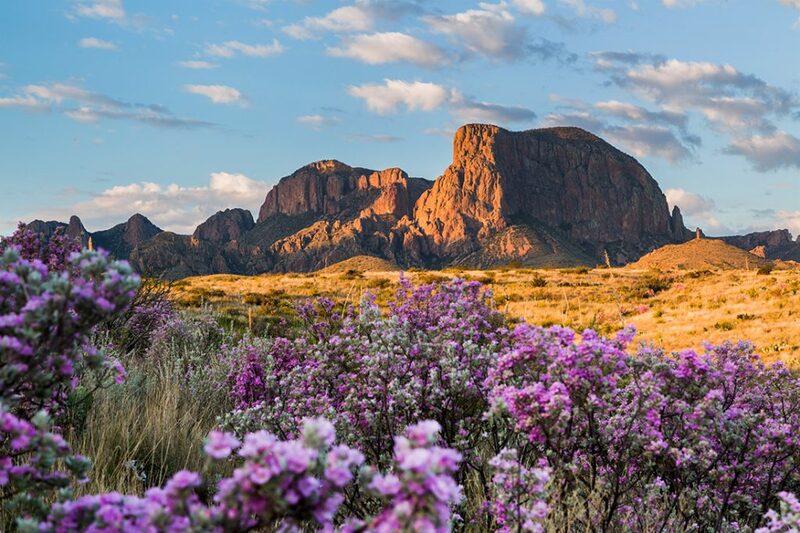 Though Big Bend in 2017 received a record 440,276 visitors, it is still one of the most remote and least-visited national parks in the country. This mountain system is visible from many points within the park, jutting high above the desert and covering about 40 square miles. Its highest point, Emory Peak, is accessed via the Emory Peak Trail, and the best way to explore the Chisos is on foot. There are 42 designated campsites dotted around various points in the backcountry. The Northeast Rim and Southeast Rim offer expansive views of the desert below. As you climb in elevation, the terrain transitions from high desert to an alpine environment. 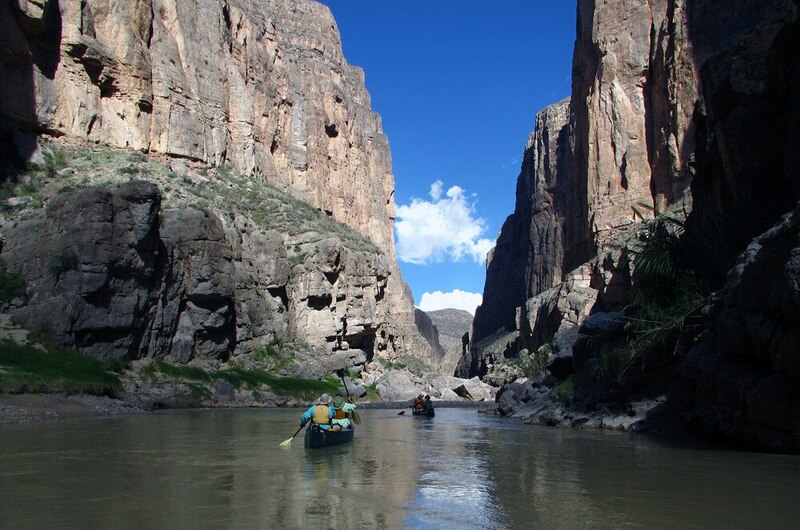 From the Rio Grande, vertical cliffs rise 1,500 feet in this canyon, best viewed from a kayak or raft. From the put-in at Lajitas (a village outside the park) you’ll get views of the desert and riparian areas as you float downstream 13 miles until, for the last seven miles of the float, you enter the canyon and encounter whitewater culminating with a Class IV rapid. For a shorter trip, consider launching at the Santa Elena Canyon Trailhead to paddle upstream a few miles before gently floating down back to the beginning. From the trailhead, you can hike to the mouth of the canyon or lounge around on the beach when the water is low, a 1.7-mile round-trip amble. Two miles down a bumpy gravel road, you’ll find a soothing bath located in the Hot Springs Historic District. In the early 1900s, the area was settled by J.O. Langford who heard the 105-degree water could cure "stomach trouble, rheumatism, [and] all sorts of skin diseases. He opened a resort, even with a nearby post office, all of which has since shut down with only skeletons of the buildings that remain. From the parking area, hike a quarter mile to the spring nestled on the edge of the Rio Grande, just yards from Mexico. Just across the border in Mexico is the diminutive town of Boquillas, population around 300. Getting there requires going through the National Park Service’s Boquillas Crossing Port of Entry with your U.S. passport, then taking a boat across the Rio Grande piloted by Mexican locals for a $5 fee—or you can wade across on your own when the water is low. From there, hitch a ride on a burro for another fee or walk a half mile to the town. Be sure to check in with Mexican authorities once arriving, then you can peruse the local crafts for sale, kick back with fresh tacos and have a cerveza at one of the two restaurants in town. 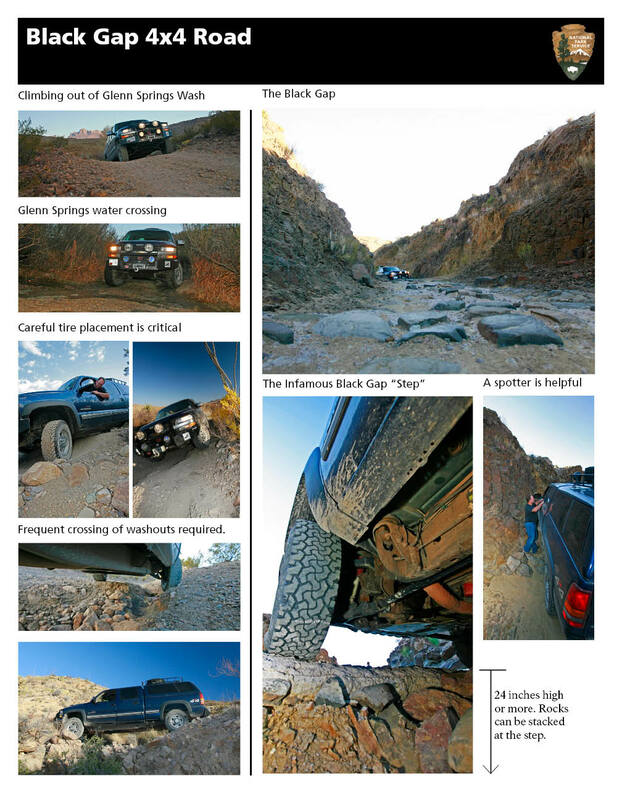 Some of Big Bend’s backcountry roads require high-clearance and four-wheel-drive vehicles while others are accessible to motorhomes. The distinction is in the name—primitive roads cross washes and bedrock for an experience that’ll test the most capable vehicles, but improved dirt roads are tamer. Although anyone driving down Big Bend’s little-patrolled backcountry roads should be well prepared in case of an emergency. Take the 51-mile River Road from the Rio Grande Village to Castolon, crossing boulder-strewn washes. It takes a day to navigate the road due to the rough conditions, but can be turned into a multiday excursion as there are several campsites dotted along the route. Nearby is 16-mile Glenn Springs Road that skirts the edge of the Chisos Mountains, through a desert spring rich with history, while Black Gap Road is so rough you’ll need four-wheel-drive for various points on the 8.5-mile path. Any vehicle should be able to access the Dagger Flat Auto Trail, a 14-mile round-trip drive through a forest of giant dagger yuccas. Big Bend’s roadside campsites have no running water, shade or other amenities, but solitude is guaranteed—you’ll only have to share the site with javelinas and other desert critters. While some of these campsites can be accessible for most vehicles, some are recommended to have four-wheel drive and high clearance. If your overlanding adventure rig is built to go off-grid for extended periods, you can set up camp for up to 14 consecutive nights and you’ll likely see only a few other people throughout your stay. The Grapevine Hills campsites are along an improved road, accessed by most vehicles, with stunning views of the Chisos Mountains. Take your four-wheel-drive rig 5.3 miles down Juniper Canyon Road to access the Robbers Roost campsites, where you can stargaze deep in the backcountry. 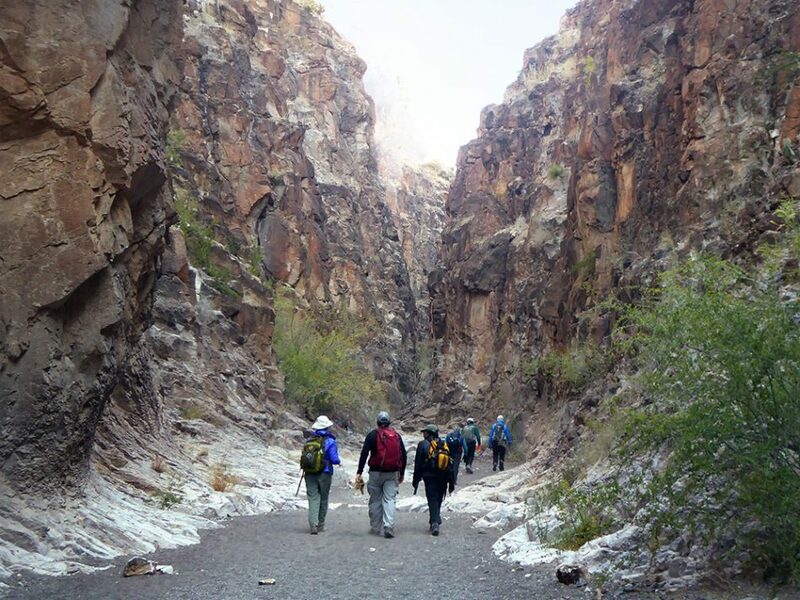 More than 150 miles of hiking trails will take you into the depths of Big Bend, along the curve in the Rio Grande (the park’s namesake) or through the surrounding desert and mountains. Even during the winter, guides offer trips down the river with jaw-dropping views of vertical canyons hugging the water’s edge. Trek along the lowest elevations in the park near the Rio Grande, following the Boquillas Canyon Trail for 1.6 miles round-trip. This easy path offers amazing views of the river from the top of a bluff before it meanders to the water’s edge near the opening of the steep-sloped canyon. Farther into the desert interior, check out an old homestead at the Sam Nail Ranch nestled in an oasis, an easy 0.3-mile round-trip. At 4.8 miles, the Chimneys Trail winds through the desert to volcanic dike formations containing Native American rock art. Up around 7,000 feet, hike 5.25 miles to Emory Peak. The last quarter mile involves steep climbs, the final leg requiring a brief, 25-foot scramble on an exposed rock face—culminating in 360-degree views from the park’s highest point. A hiker with an REI Adventures trip walks among cactus, yucca and stone in Big Bend National Park. 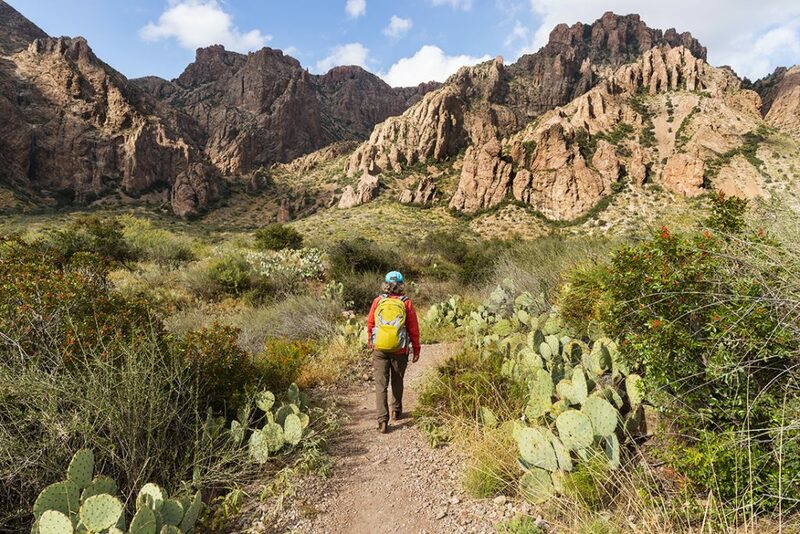 A combination of five backcountry trails, the Outer Mountain Loop takes you 30 miles through Big Bend’s diverse terrain ranging from desert to the woodlands of the Chisos Mountains. This trip takes around three days, so be sure to bring enough water as springs and creeks can be unreliable. You’ll need to reserve backcountry campsites, all of which have food storage lockers—Big Bend is black bear country. For a shorter trip, hike the South Rim Trail, a 12-mile overnight around the edge of the mountain range. Along the rim you’ll have unobstructed views stretching for miles into Mexico. Due to Peregrine falcon nesting season, parts of the trail are closed from February to May. Floating the Rio Grande is a perfect way to experience the wonder of this region. Along the river’s riparian zone, towering cottonwoods provide shade for an array of wildlife like beavers and great blue herons that seek refuge along the banks. There are plenty of options for kayaking or rafting trips, which can be half a day or multi-day adventures. Floating the Santa Elena, Mariscal or Boquillas canyons offer stunning views of the towering canyons around the Rio Grande with opportunities for navigating whitewater. For up to a 10-day trip, float down the Lower Canyons, where you’ll find solitude and Class IV rapids. However, between the canyons, the gentler waters meander past beautiful views where you might not see another boater for days. Several outfitters near the park provide guided multiday trips down the river. More than 160 miles of backcountry dirt roads and over 100 miles of paved roads provide cyclists with plenty of options to choose from. Take your road bike through one of the most scenic drives in the park, 35 miles one way on the Maxwell Scenic Drive from Panther Junction to Castolon. Along the way you’ll get great views of the park, although the trip can be challenging with plenty of steep hills. Opt for your mountain bike along the unpaved Old Maverick Road for 14 miles one way. Cross over washouts through the brushy desert, hiding historical points of interest like old homesteads, before ending at Santa Elena Canyon. Big Bend’s miles of rustic backcountry roads provide a perfect place for horseback riding. Grazing in the park isn’t allowed, so bring plenty of feed for your animals—water should be considered, too. There are a few stables near the park that offer day trips or multiday adventures, and usually no experience is required to enjoy a ride on the trails around Big Bend. There are several options for a comfortable stay at Big Bend’s frontcountry campsites. Tenting in a campground gives you many comforts like access to water and bathrooms, yet provides a sense of the wilderness that surrounds you. For those who want all the comforts of home, there are plenty of rooms in the park’s lodges. The lodge is located at the base of the Chisos Mountains at around 5,400 feet, providing cooler temperatures in the summer. Open year-round, there are 72 rooms available with different housing options. The Casa Grande and Rio Grande Motel rooms offer basic amenities. The Emory Peak Lodge has eight rooms while the five Roosevelt Stone Cottages provide all the comforts of home. There’s also a restaurant and convenience store open early so you can fill up on snacks and water before trekking to the nearby mountains. There are three frontcountry campgrounds available at Big Bend. The Chisos Basin Campground can accommodate 60 tents and campers, although it’s recommended only for RVs less than 24 feet and trailers under 20 feet. Here, some of the best hiking in the park is only steps away. The Cottonwood Campground is a smaller, 24-site area with picnic tables and places to refill water. The largest in the park, the Rio Grande Village Campground is along the banks of the river with 100 sites, within walking distance to showers and a store. While none of these sites have hook-ups for campers, the 25-site concession-operated RV park near the Rio Grande Village does. A backcountry use permit is required for camping in the backcountry, which extends to roadside camping and backpacking, as well as floating the river for either day use or overnight trips. Pick up a permit in person at one of the visitor centers during business hours at a cost of $12 for overnight trips (free for stock or day use). Pack your passport if you plan to cross into Mexico to visit the town of Boquillas through the National Park Service’s Port of Entry. While U.S. currency is accepted by the locals, it’s recommended to bring smaller bills. The closest airport is 235 miles from the park headquarters in Midland/Odessa or in El Paso, about 330 miles away. There are bus services to Alpine, still 100 miles away from Big Bend. The best options are renting a car or making the drive in your own vehicle. There are five visitor centers in Big Bend, although only the Chisos Basin and Panther Junction visitor centers are open year-round, while the others close from May to October. Begin your trip at Panther Junction, where you can secure backcountry or river-use permits and fill up on water. Due to the park’s remoteness, amenities are limited. Fuel is available within Big Bend at Panther Junction and the Rio Grande Village, where you can also fill up on necessities and provisions. You’ll find a convenience store at the Rio Grande Village and the Chisos Mountains Lodge, but other amenities must be bought outside the park—Terlingua is the closest town, 30 miles from the park’s headquarters. Weather in Big Bend can change on a whim, especially when factoring in elevation changes. At the lowest reaches near the Rio Grande, temperatures can average 20 degrees warmer than up in the Chisos Mountains. Winter is typically mild with plenty of sun, with average highs in January at 61 with lows around 38—snow is normally rare. It’s easy to find a respite from the harshness of winter in Big Bend, which means New Years can be one of the busiest times at the park. Fall and spring are pleasant, with highs in the 80s and lows in the 50s and 60s. During the summer, when temperatures can climb above 100 degrees, you’ll find much more solitude—escape the heat at elevation under the cover of the canopy. During the rainy season at Big Bend, from May to September, severe thunderstorms and flash floods can be common. 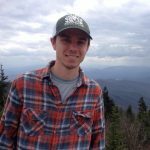 So, it’s best to be aware of where you’re camping at night, especially deep in the backcountry at lower elevations where rising water can leave you stranded. High temps and quick-moving thunderstorms make it important to be prepared before entering the Big Bend backcountry. In the summer, it can be brutally hot with dangerous conditions, and water can be scarce in certain areas So, it’s essential to carry at least one gallon of water per person per day in the summer and a little less in the cooler months. Try to avoid the warmest parts of the day while hiking, instead opting for shady areas. Loose, breathable clothing helps your body to regulate its temperature. In the winter, pack for warm days and cold nights—base layers and a 20-degree sleeping bag are a must.